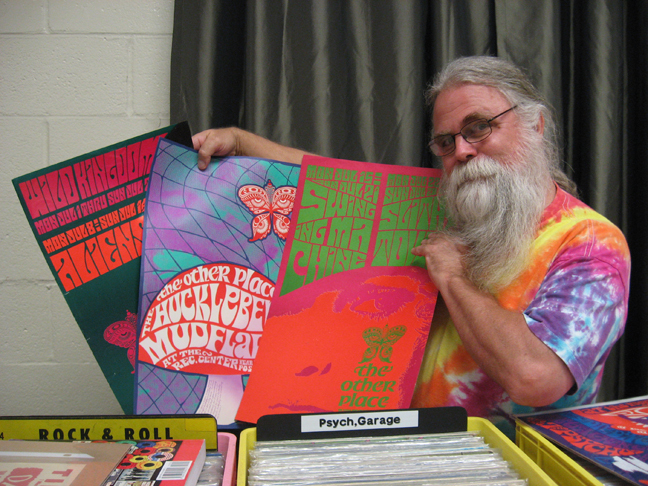 Hailing from Richmond, Virginia, Wood has been participating in record shows since 1981 and in the Arbutus Record Show since it began. He comes up from Virginia every month with his vast collection of albums and sometimes something a little extra special. While some vendors specialize in a particular genre of music, he says he loves it all. Although his mom got him started, one person inspired him to want to hear everything. His name was Larry Norman, a 1970s Christian folk singer. After John heard a street performer sing one of his songs, he went on a quest to find every record Norman produced. John guesses that he probably has the world’s largest collection of his records. This was verified by the fact that about 20 years ago his collection was flown to California as evidence in a medical lawsuit spearheaded by Pat Boone on behalf of Norman. Norman had gone to a hospital in Europe suffering from heart problems. Sadly, the doctors thought he was a just a burnt out hippie on drugs. They put him in a room by himself and he subsequently had a heart attack. John’s extensive collection of Norman’s records and articles was the turning point in the case. John says his single most favorite record in his collection is Larry Norman’s “Only Visiting This Planet” from 1972. As a graphic designer, my eye was drawn to some very beautiful posters John had on display. This was the something “special” he had brought with him this time. In the 1960s, the psychedelic poster was born. The most well-known came out of San Francisco, considered to be the hotbed of the counter-culture movement. The famous Avalon and Fillmore ballrooms commissioned these posters to promote their acts. The style took its influences from the drug scene as well as movements in art such as Art Nouveau. But local garage bands around the country also produced posters of their own and they have become highly collectible. John had uncovered some very rare posters from North Carolina. Dating from 1967, they advertised bands with names such as “Huckleberry Mudflap”and “Slithy Toes.” Not as well-known as the Grateful Dead perhaps, but a visual and typographical delight nonetheless. 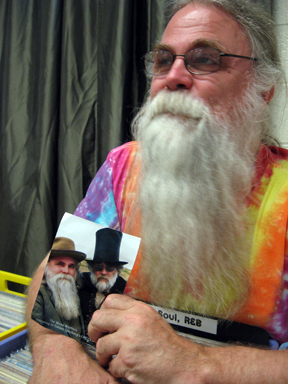 (John pictured with his posters below). John Wood has another avocation that would be the envy of music lovers everywhere who dream of getting up close to their favorite artists. When he’s not selling and hunting down records or in movies, John handles security for 150-200 musicians and bands a year, working with them backstage and at the tour buses. He has become trusted by the artists and the venues alike. A sampling of the performers is impressive and diverse: ZZTop, Snoop Dogg, The New Doors, Alice Cooper, The B-52s, The Killers, Hailstorm and Lamb of God – even Weird Al Yankovic! Always friendly, knowledgeable and a great storyteller with an amazing collection of records in every genre, a visit with John “The Record Man” is a must! (Article and photography by Lynne Menefee). Good article of this good friend . John brings alot of records to the show, but as the article points out his extras add some visual interest as well. 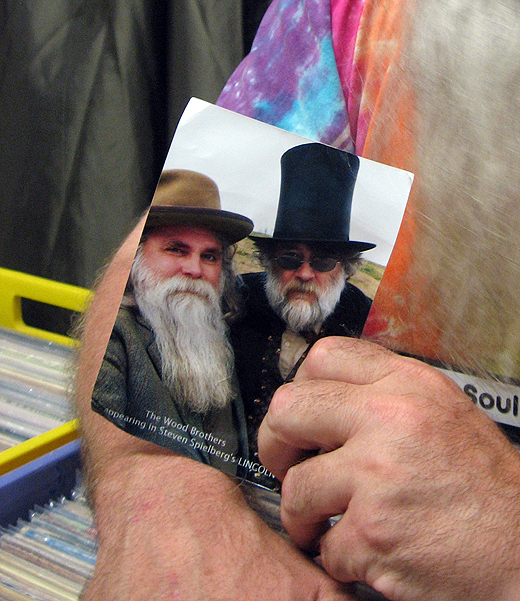 Patrons at the Arbutus Record & CD Show just never know what treasures they’ll find. Are these posters authentic ones used for Other Half shows at the time, or modern creations? The Wild Kingdom/Aliens posters and the Swinging Machine /Slithy Toes posters especially seem to use a standardized typeface. I’d love to know these are authentic ’60s posters. Anyone in contact with the artist(s)? The posters shown ARE authentic posters that originated from the estate of the promoter. When they were discovered, I negotiated (at a considerable cost) a purchase for the entire lot. I have duplicates of a few of the posters. In all, there are about 7 or 8 different posters. (I have had these for a long time, can’t remember the exact number. ) The three shown in the illustration are duplicates which I can sell. They are unique and original 1960’s west coast poster art. And other than the few that originated FROM this collection before I purchased the rest, I’m not aware of them circulating in any other sales. Hope this helps.